I wanted to talk a little bit about my monthly planning process and share a few tips that might help someone else. I always try to do my monthly planning a couple of days before the month ends. I don’t predate my pages more than a day in advance, because I never know just how much space I’m going to need for any given day. It can be difficult to estimate how many pages I’ll need for the rest of the month unless I wait until the last couple of days. I can make a rough guess based on an average month, but even that fluctuates between 20 and 30 pages. For instance, in my current notebook, December 2017 took 22 pages, January 2018 took 21, February took 24, and March took 27. April begins on Page 133, and this notebook has 240 available planning pages, minus the two-page Tombow spread I always create at the end of the journal. That means I have 105 pages from the beginning of April to the end of the journal, which hopefully means I’ll be able to fit May and June in this notebook. Back to the point, generally do my planning in the last couple days of the month. For April, I did my planning on Thursday, March 29. A lot of times I do my planning with my mom because it’s kind of fun to lay out the coming month with a planning partner. The first thing I do is try to make sure I have everything I’ll need: my Bullet Journal, my tickler file for the coming month, my washi tape, my pens and Tombow brush pens, my stickers. It’s no fun to have to go hunting for something you need in the middle of your planning session! One of the little tricks I’ve learned over the months is to fill out some of my habit tracker before sticking it in place. Obviously, sometimes I change what I’m tracking–you can see that in March I was tracking Lent, which is over on April 1. I was also taking care of mom’s cat Edmund for a while in March, so I needed an easy reminder to give him his meds; I put it in my tracker for the 10 days I had him, and just exed out the other days. Since April begins Quarter Two of 2018, it was time for me to sit down and evaluate my quarterly goals and progress as well. I didn’t do that during my monthly planning session. I needed time to go back and review what I’d intended to do during Quarter One, what I’d actually done during Quarter One, what needed to be migrated to Quarter Two, and what new tasks I had during Quarter Two. As part of that, I made a list of the deadlines I had coming up in Quarter Two. There are several in April, and I was starting to feel stressed about them. Putting them down on paper helped me capture them and get a realistic view of them. Once I had my list of deadlines, then I broke each project down into action steps that needed to happen in Quarter Two. From that list, I added a few items to my April Task List. Some of those steps won’t take place until May, but that’s fine–they’re recorded on the quarterly list so they’ll be easy to migrate. Sometimes I have help. 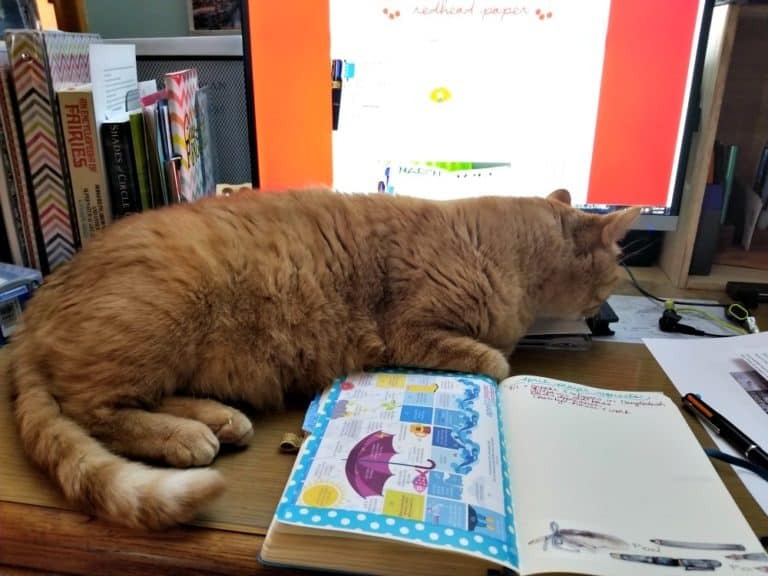 Eustace decided I was definitely in need of help with the quarterly planning! What about you? What’s your planning process? Do you have any tips or tricks that make it easier for you? I’d love to hear them! I’ve talked before about why I bullet journal. The system works for me–it’s flexible, it allows me to use the parts I like from other planning systems (like GTD), and it makes me mindful of what I need to be doing and when. I’ve been using the bullet journal system for almost three years, since March 2014. I’ve never used a single planning system that long! 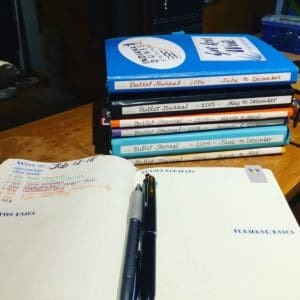 Of course, once I started keeping a Bullet Journal, I realized one of the strengths, for me, was the way I can use it as a sort of scrapbook as well as a planner. I love scrapbooks, but I have a huge backlog of things to put in scrapbooks. With my Bullet Journal, I just use a little adhesive or washi tape to stick things like photos and ticket stubs right into my planner. And stickers. Oh, my gosh, stickers! 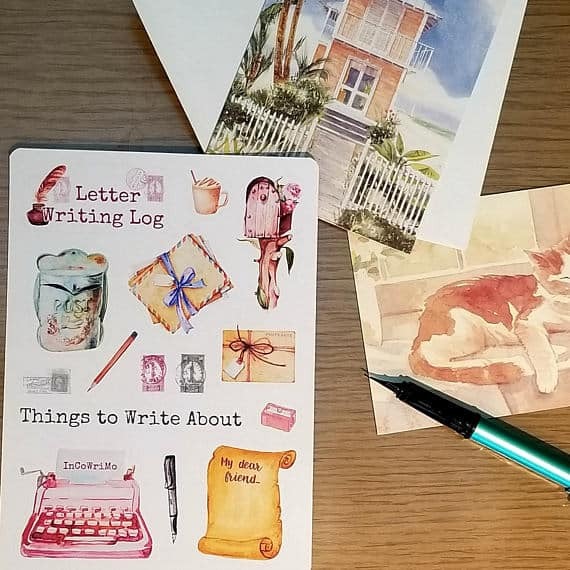 My #InCoWriMo / letter-writing stickers with some of the notecards I’m going to use this year. I started out buying some planner stickers from other people. I loved the stickers I got from Mila Print Shop (sadly not open at the moment) and Boho Berry Paperie. But after a while that gets expensive, and sometimes there were stickers I wanted that people just didn’t make. I started investigating. There had to be an easy way for these Etsy sellers to make the stickers I loved so much. I did some Google searching and discovered the Cricut. Ladies, I fell in love. I realized I had all these ideas for stickers I needed, and there were probably other people out there who needed those same stickers. I talked to my mom, whom I’d introduced to bullet journaling early on, and then some of my friends who were getting into bullet journaling. They all had stickers they wanted. I ran some numbers and decided it was a chance worth taking. I talked to my dad, who agreed to invest in the business by actually buying me a Cricut, and I started experimenting. Three months after I got my Cricut and started feeling comfortable with it, Redhead Paper came to life. I have about fifty listings in Redhead Paper right now. One of the first things I made was a set of daily date stickers. I know, it’s kind of basic, but having a sticker that tells me it’s Wednesday, January 24, 2018, makes my life a little bit easier on a daily basis. Turns out, lots of people need daily date stickers for their bullet journals! These stickers are consistently high-selling items, so I know there’s a need! I also started experimenting with habit tracking. 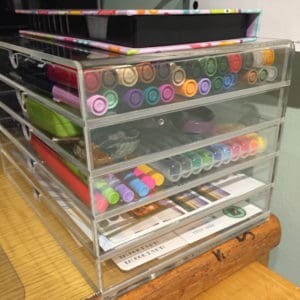 All the habit trackers I’d seen on Etsy in the past were oriented horizontally, which meant I had to turn my bullet journal sideways to read them. I designed my habit tracker to be vertically oriented. I’ve had a lot of great feedback from people about that. 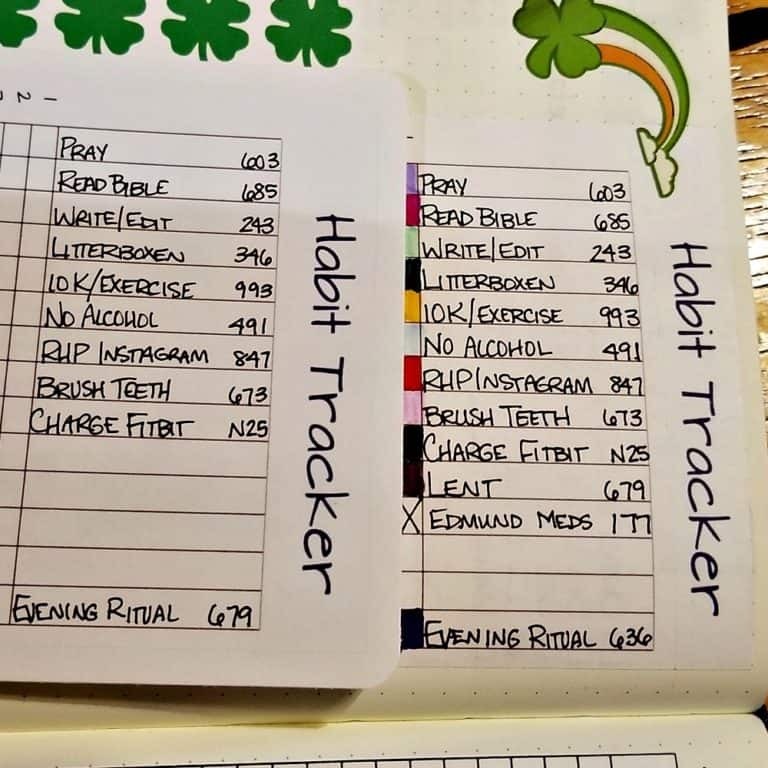 Part of the Habit Tracker I designed – you still have to turn it sideways to fill it in, but for tracking purposes on a daily basis, you don’t! I had designed mini month calendars and month tabs for my mom even before I had the Cricut (and cut them out for her by hand). So it wasn’t much of a stretch for me to create stick-on month tabs. My friend Amanda wanted mini calendars, too, so I added those. In addition to working at a museum and creating stickers, I’m also a fantasy author, and I wanted to have stickers that reflect my love for writing, help me track my writing progress, and more. So I designed those. What should I ADD to my Etsy Shop? I would love to know what kinds of stickers you need! I have some things in the works–things like vacation planner sets, water tracking, and birthday planning–but I love taking Etsy commissions, and some of those have given me ideas for new listings. If you have a need for a certain kind of sticker, comment here and let me know! I do a lot of goal-setting. In addition to running an Etsy shop, I have two part-time jobs and am also a published novelist. I have a lot of tasks and projects to keep track of, and there’s no way I can keep track of them all if I’m just relying on my own brain. Do you ever feel overwhelmed with everything life is throwing at you? Stuff is coming at you from every direction and you can’t spin around fast enough to catch everything. I occasionally feel like life is a cosmic game of dodgeball! When it gets overwhelming like that, I sit down, switch on the Focus mode of Brain.fm, and do a total brain dump. Just write down all the crap that floats through my head, all the things that are taking up space in my mental RAM, and quantify them. I generally use a separate notebook to do my brain dumps because they can take up a lot of space! But as soon as I’ve finished, I start categorizing everything I wrote down (highlighters are good for this), and that’s where my Bullet Journal comes in. Once I’ve quantified everything I need to do, I can start figuring out what the next concrete step is to take on every outstanding project. Sometimes I go through the brain dump in the order I wrote things down and sometimes I skip around. Sometimes I realize that several items in the brain dump belong in a collection in my Bullet Journal. Sometimes an item just needs to go on my monthly or daily task list. As soon as I’ve recorded a brain dump item somewhere in my Bullet Journal, I mark it out on the braindump list. So What About Project Planning? Projects with a lot of steps are different beasts from a simple to-do, that’s for sure. But they’re not really the gargantuan, out-of-control monsters they can feel like. My rule of thumb is to write down every big step. Sometimes I realize the list I’ve been working with doesn’t have all the steps, so I add them in–even if I add them after completing the step. I confess I don’t always write down every single tiny step because that would take a lot of paper! But if a project is starting to feel overwhelming, I sit down and do it, even if I have to set up a separate collection just for that project. 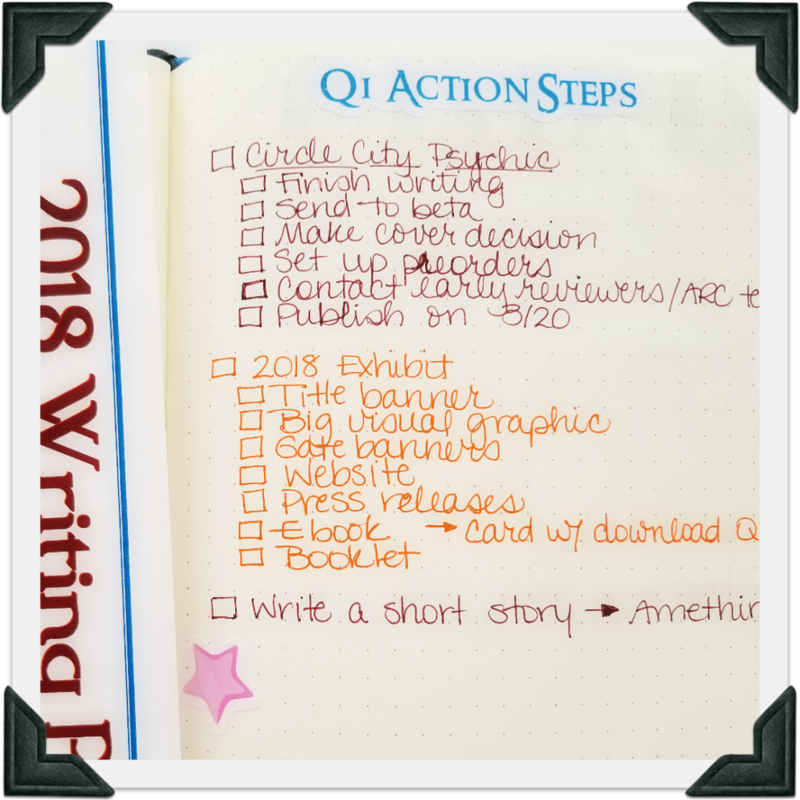 I currently have two major projects listed on my Quarter 1 Action Steps page in my Bullet Journal, and I have the components broken down on that page, as you see in the picture, though there are actually lots of little steps to each component. I don’t have this goal broken down into all those steps because this is the sixth exhibit I’ve helped design, so a lot of those steps are internalized for me. On the other hand, I often end up breaking those components down on my Monthly Task List. If you need to break down the components into every step on your project page, do it! The best thing about Bullet Journal is how you can customize it to work best with your style of work. I tend to use two different methods for tracking my goal and project progress–I’ll call them passive tracking and active tracking. For active tracking, I’ll actually design a tracker to fit that project. For instance, another project I’m working on for work involves going page-by-page through a book we’re publishing. It’s a huge task, so I drew a special tracker for it–just a set of boxes that are numbered with the chapters of each book. As I finish each chapter, I fill in the box and I’m able to see that I am actually making progress, even if it doesn’t feel like it. Passive tracking, on the other hand, is basically just me paying attention to what tasks I’m migrating from day to day, week to week, or month to month. One of my favorite things about Bullet Journal is the migration process. 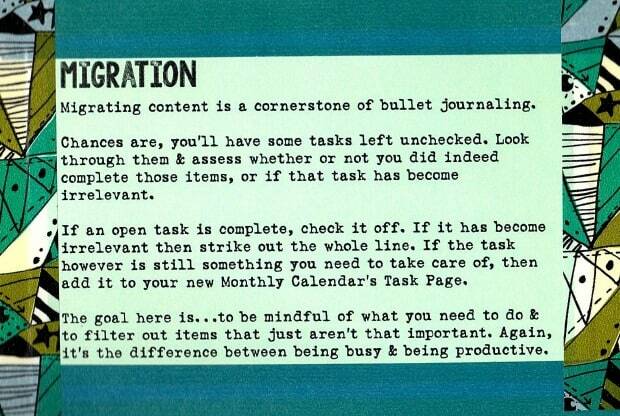 Ryder Carroll points out that migration is “a cornerstone of Bullet Journaling.” I know a lot of people dislike the migration component, either because they think it’s redundant and/or pointless or because they don’t like taking the time to do it. For me, the redundancy and time-consuming nature of migration is exactly the point. Why am I putting off this task? Do I need help from someone else? Am I waiting for something? Is there a step I actually need to do first? How long do I need to complete this? Will it really take me longer to do this task than it will to migrate it to yet another page? A lot of times, after considering these questions, I either buckle down and do the task or strike it off my to-do list entirely. Whew! This is a longer blog post than I set out to write! I hope it’s helpful for you to see how I do goal planning and task/project management in my Bullet Journal. If you have any tips, let me know! And if you’re looking for a sticker set to help you record your goals for 2018, check out my Goal-Setting and New Year’s Stickers set on Etsy! Until March 31, 2018, you can get 18% off your $5 order by using coupon code NY2018. 1. What are your main priorities in life (i.e., family, profession, marriage, personal wellbeing, etc.)? List them in order of importance. 2. 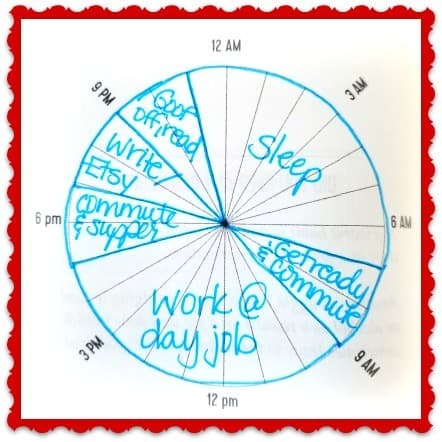 Use the graph to chart how you invest your time during a typical 24-hour period. 3. Does your time chart (where you’re spending your hours) reflect the priorities you listed in question 1, and in the correct order? No. For one thing, I’m spending so much time at my day job I don’t have time to focus on my writing and Redhead Paper. I do pretty well at spending time with family, though I have a couple of friendships I really want to revive this year. 4. 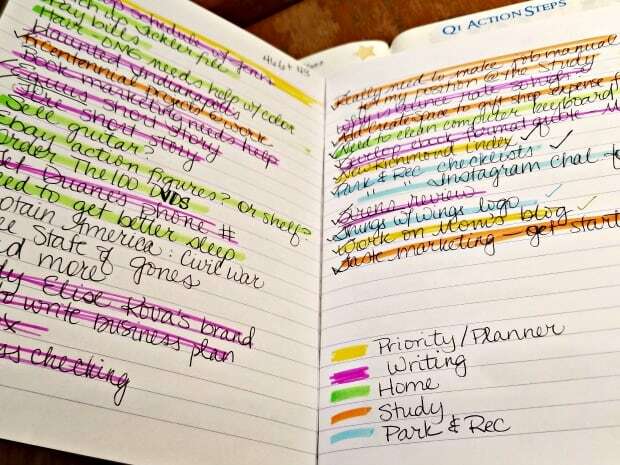 How might you rearrange your schedule for better results? Make myself go to bed earlier so I can get up an hour earlier to work out. I know I feel better when I’m working out regularly. Working out in the morning isn’t my favorite thing (I hate mornings in general) but I know it would help me feel more energetic throughout the day and help me stay more focused and productive. I would also like to eventually transition out of needing two day jobs so I can focus more on my writing and Redhead Paper. These goals are tied back directly to my objectives for the year, which I posted in Day 3. So I worked from those objectives and listed action steps I could take to achieve them. FInancial: Create a debt snowball plan and stick to it. Eat out no more than twice a month. Post daily on Instagram to increase Redhead Paper’s visibility. Set up preorders for my book releases two months in advance. Spiritual: Set aside time every evening to read one chapter of the New Testament a day. Mental: Read one novel a week from the list of Books to Read in my Bullet Journal. Create a plan for the non-fiction books, including the number of pages I need to read every day when I’m working on them. Physical: Hike once a week. Do a 30-day beginner yoga challenge in January/February. Have Shakeology for breakfast. Relational: I want to spend more time encouraging my dad. I want to help my mom declutter her house, which I know is driving her crazy. And I would like to spend more face-time with my best friend, as well as deepening another friendship. So this is how I want my 2018 to go. What about you? Are you working on goals for the new year? What are they? Pay down debts (personal and business). Launch a novel with 100 preorders. Have a $1000 Etsy month in Quarter 1 and $5000 in Etsy profits for the year. Make $2000 from book sales this year. Make prayer a regular practice (using Kelly O’Dell Stanley’s prayer prompts and other tools). Read NT Wright and Thomas Merton. Of those 50, make 25 of them #OwnVoices books. Of those 50, make 10 of them nonfiction books. Of those 50, let 1 be a complete read-through of the Harland book on sailing. Help Mom declutter and decompress. Deepen friendships with two particular people. Write 1 notecard a week to one of my friends. Do yoga on a weekly basis. The ability to schedule automatic bill payments out of my checking account. I know, this seems a little mundane and boring for a 2018 vision. But I have the feeling there are a lot of Gen-X and Millennial folks who will understand! Being able to schedule all my bill payments means that I’m not living paycheck-to-paycheck anymore. It means that I’ve made some responsible choices in how I spend my money. It also means my side hustles are doing well enough that I have some extra cushion in my monthly income. In addition, it’s important because I can focus on what’s truly important instead of feeling like I’m running from fire to fire, trying to put out the flames. For one thing, I’m going to continue adding to the products I offer for sale at Redhead Paper on Etsy. For another, I have two novels scheduled to publish in 2018. I also want to concentrate on selling more short fiction in the coming year. I have trouble scheduling my writing and Etsy creation times around my 2 day jobs. I sometimes resent the fact that I have a lot less downtime than a lot of people I know. Especially since, for Christmas, I got a 60-day pass to World of Warcraft! I’m going to have to schedule my time much more strictly for the next few months if I really want to meet my business goals. This is a easy one! I’ll know I’m successful when I can schedule all my bill payments on the first day of the month. To achieve this I need to establish a set payday from Cathartes Press/Redhead Paper to Stephanie, and I need to stick with that date and amount. I have to make sure I leave enough in my business checking account to pay all the bills as well as making payroll. I started writing myself paychecks in 2017, but I’ve been playing sort of fast and loose with the amount and the day of the month that I write the check. That’s no way to run a business, so I need to correct that in 2018. What would you do in 2018 if you knew you could not fail? I think I answered this wrong. I said publish The Loyalty Factor, but the thing is–it’s still not ready to be published, and I know it. So if I knew it would be perfect and I couldn’t fail, sure. But I’m not sure that’s where this question was going. If I knew I could not fail, I would cut back on my work hours to give myself more time to write and create Redhead Paper designs. What are some things you could be doing that you’ve been too afraid to try? How can you stretch your comfort zone? I think for me it’s less about being too afraid to try something. I tend to be impulsive by nature, so my comfort zone is leaping before I look. I think if I were going to stretch my comfort zone, it would be to act with patience and consideration and to take daily steps towards achievement instead of jumping in full speed ahead. What have you been struggling with for entirely too long? Getting into a routine of consistent work. I’ve always had the habit of throwing myself entirely into a single project and going whole-hog on that project to the exclusion of others. In addition, I tend to work hard and fast instead of slow and steady. I’d like to meet a weekly quota in my writing production and in my Redhead Paper design. What could you outsource, delegate, automate, and/or stop doing in 2018? I’ve been unable to think of anything for this question. I already have help filling Etsy orders and with house-cleaning. I suppose I might be able to outsource cover creation for Circle City Magic books. I already hire the art for my epic fantasy, but for the urban fantasy books I did the cover creation myself, and that’s time-consuming–not to mention there are people out there who can do a much better job than I do. In what ways and which areas will you “upgrade” your life? I’m going to repaint my office and set it up with a standing workspace. One of my favorite things about the Bullet Journal system is how adaptable it is. You don’t really need any special equipment–any notebook and pen will do. I belong to a few BuJo communities on Facebook, and it’s surprising how often people ask, “Can I–?” on those groups. Yes, you can! You can do anything you want with your Bullet Journal! That said, I do have some things I love using for my Bullet Journal. 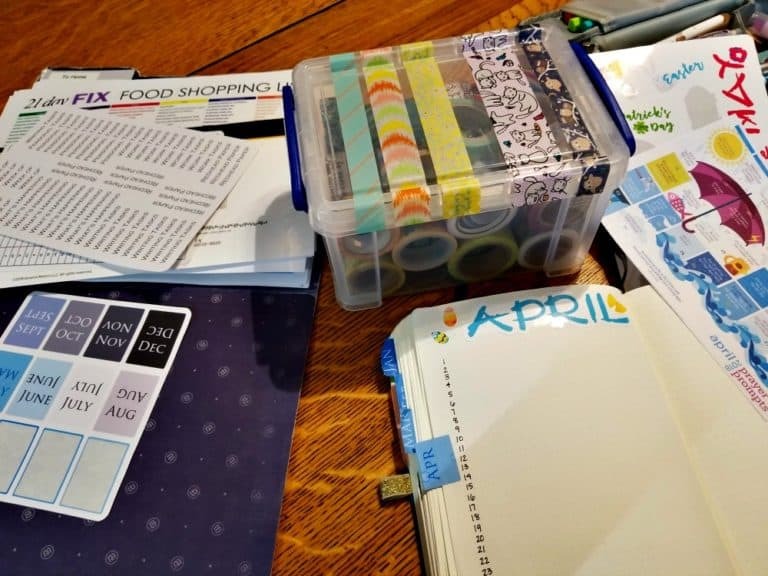 In this post, I’m going to share some of my favorite BuJo supplies and resources. Disclaimer: Some of these links are affiliate links. In plain language, that means I get a tiny amount of money from those items any time you buy–at no extra cost to you. My favorite notebooks to use for Bullet Journaling are Leuchtturm 1917 notebooks. They have fountain-pen-friendly paper, the pages are pre-numbered, and there’s an index in the front. Leuchtturm 1917 is the notebook BuJo-creator Ryder Carroll chose to make the official Bullet Journal notebooks. At first available only in black, the official notebooks are now available in emerald green. If you can’t afford a Leuchtturm 1917, though, there are plenty of other good options. I’ve used Moleskine Volants, Moleskine Cahiers, Picadilly notebooks, and even a cute spiral-bound notebook. Bottom line, if you have a favorite notebook, use that for your Bullet Journal, because Bullet Journal is all about what works for you. My favorite every-day-carry pen is a Pilot Hi Tec C Coleto Lumio Multipen. I use .5 refills in orange, turquoise, brown, and apple green because I color-code my tasks and events for context. Orange is one job, turquoise is another job, brown is writing, and apple green is home & personal. I also have a Pentel EnerGel black ink pen that I carry every day. The multi-pen and the black ink pen are the basic essentials of my daily Bullet Journal use. I also have a 10-color set of Staedtler Triplus Fineliners I use daily. They live on my desk, in a new five-drawer acrylic set I just got at the Container Store. I like seeing all the colorful pens! I’ve recently branched out a little more. I bought a set of Papermate Flairs, because so many people seem to love them for Bullet Journaling. I’ve been using them a little, but I can’t pretend they’re my favorites. Still, they’re a good alternative. My recent treat to myself (thank you, tax refund time) is a couple of sets of Tombow Dual Brush Pens. I got the Secondary set and the Landscape” set, because I decided my Staedtler and Flair sets already had the primary colors covered. Now I just need to learn how to do brush lettering! I’ve been watching videos on YouTube. Does anyone have a favorite tutorial? Here’s a caveat: I make stickers and sell them at my Redhead Paper Etsy shop, so of course I love my own stickers! But there are plenty of other sticker-makers out there I love, including Boho Berry Paperie and Mila Printshop. I also love finding stickers at Michael’s. So those are my favorites. What are yours? Sometimes when I’m in a meeting, people look at my bullet journal and ask why that system is better than others. So today I wanted to talk about my BuJo Journey. I tried everything. Paper planners. Online calendars. Scheduling and task management apps like Trello. Nothing really worked for me until 2010, when I tried David Allen’s Getting Things Done system. That made sense to me, having project lists and next action lists and context lists. But after a year or two and a job change, I realized the GTD system wasn’t really working for me anymore. So the tickler file was working, but my planning system wasn’t. 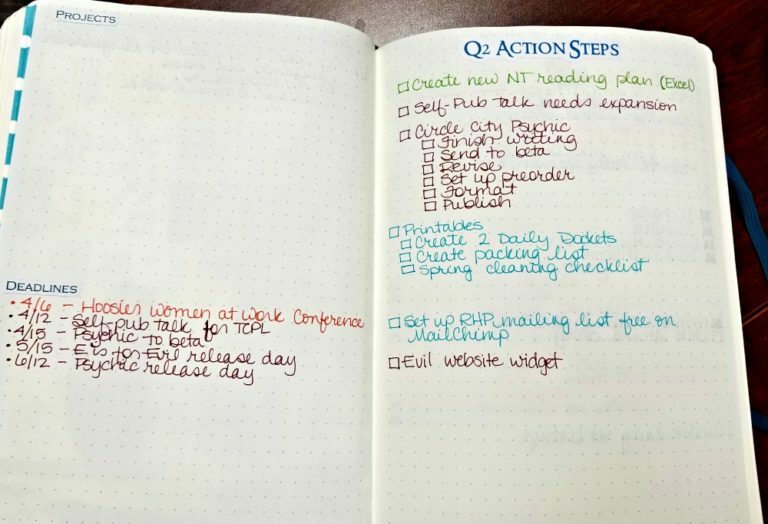 Fast-forward to March 2014, when I discovered Ryder Carroll’s Bullet Journal system. I honestly didn’t expect it to take, but I thought, “Hey, I’ve seen this mentioned several times lately, so why not try it?” (I think Lifehacker was the first place I saw it, but I’m not sure.) So I set up a spiral-bound notebook I already had. I’d only used it for about two weeks before I realized that hey, this system really clicks with me! I started out buying Moleskine Cahier notebooks. 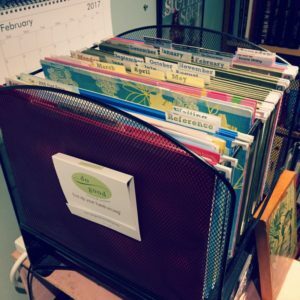 I could fit about two months in each notebook, and pretty soon my boss started saying, “Hey, did you write down in your little book when we…?” It felt awesome to be able to say yes every time. I experimented with notebooks for a while–Moleskine Cahiers, then a Picadilly (which sadly fell apart and had to be repaired), more Moleskines, and then the BulletJournal Kickstarter happened! I was a backer, and I’ve been in love with the Leuchtterm 1917 BulletJournal notebooks since then. I did use a lined Leuchtterm 1917 for part of 2016, but for Christmas my family got me two of the new Emerald Official BuJo notebooks, so I should be set for 2017! Now I’m branching out into different pens. I color-code my tasks, because I have two part-time jobs and I also write fiction, so I use color to track the context of my tasks and projects (still implementing some of the GTD methods I loved). I use a Coleto Hi-Tec-C multipen to write down tasks, but for things like habit trackers and coloring pages, I’ve been using Tombow Dual Brush Pens for a few weeks now. So that’s my Bullet Journal journey. I love so much about Bullet Journal, but the main thing I love about this system is its flexibility. Some of my spreads are super-decorated and pretty and fun, and some of them are simple lists. Sometimes I doodle in my spread, and sometimes I don’t take the time to do a spread for the week. I can experiment with different signifiers to see what clicks. I can see how long it’s been since I did a financial review because of my habit trackers. I can make this planner what I need it to be. I think that’s why it’s stuck so long–Bullet Journal is a system that adapts to my needs. I'm a Bullet Journal junkie, but I could never quite find the stickers I wanted--so I decided to make my own! I've also branched out into political stuff, planner stickers, and printables. 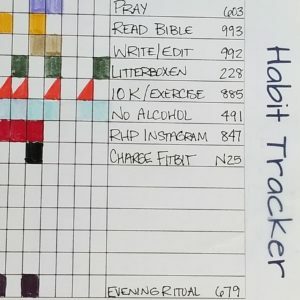 Why Aren’t You Bullet Journaling?